by Dr. Robert Langford, Ph.D.
Twelve years ago, my curiosity got the better of me and I joined other blind people who were using and enjoying computers. I had heard that these "magic boxes" could read aloud what one typed, print it out, and even check for misspellings and correct them. I was intrigued! (I had never been a good speller!) I asked all kinds of questions of the blind people I knew who were using computers. I shopped around to find the best price. That price was three times what you would pay today. I made the trip to Office Depot, gave them a lot of dollars for a work station, and then waited. Then when the computer arrived at my door I brought it in and proceeded to assemble it. Why is it that instructions never seem to be understandable? First out of the shipping container was the CPU, shaped like a big box. Where to put it? I decided on the second shelf. Then, right in front in the place of honor went the keyboard. To the side I proudly placed the monitor. A second table held the printer. Voila! I was ready to strike keys. Ah, there was another dimension. The voice. This required the removal of the CPU cover and the installation of the interfacing board. Then a friend struck keys and told the autoexec file where to find my computer’s new voice. Finally, a reboot and the voice announced that it was ready. What a wonderful feeling. Here at last was the magic box, ready to work for me in my own home. It did take many hours of listening to my training tutorials on several audio cassettes. There were several telephone calls in search of answers to perplexing problems. My new computer did cause many frustrating moments, but in the end, it revolutionized my life. After being blind for almost 50 years I was able to read and spell check what I had written. What a wonderful gift. For 50 years I had used a typewriter and had the all-too-familiar experience of being in the middle of a letter and having a telephone or doorbell ring. Then I would have to start all over again. Now using the computer’s “voice,” I could figure out where I had left off typing and move on from that point. When my document was just the way I wanted it, a single keystroke would send it on to the printer for a perfect printing. I was impressed. All my investment of money and time seemed well worth it. Soon I was keeping track of my tax and insurance records for myself. This was very satisfying. A genealogy program caught my attention and my parents, wife, brother, and kids joined their place in the family tree. Ten years later 900 entries tell me more about my ancestors than I sometimes want to know. A big plus came when a bookkeeping program found its place on my hard drive. Now I can check my balance to the penny against the bank statement. This is a big chore, which used to take many Braille entries, simplified. Now I can make a deposit by mail, write a check and mail it, or search for a check that I thought I wrote last year. This newly perfected bookkeeping skill has placed me in demand for the treasurer’s job with the local chapter of the American Council of the Blind and for my Lions Club. I may be the only blind treasurer of a Lions Club in the world. E-mail is a big source of pleasure because it is quick and easy; it makes staying in touch with family and friends a breeze. The difficulties in getting a letter created and mailed no longer exist. You can receive a note and read it yourself, then answer with a few quick keystrokes and go on to other pressing business. Last week one of my sons was in New Zealand and we exchanged daily notes by e-mail. Another son was in Israel and his e-mail messages kept me posted about our plans to attend a Dallas Cowboys game when he returns. Also taken care of this morning were the final arrangements for a cousins’ gathering which will take place in two weeks here in Dallas. I am the one keeping everyone aware of plans and the time for our first meeting here at the Langfords’ home. Amazing and wonderful is this quick and easy tool for communication. Eight years ago distressing news reached me about working computers being hauled to the dump. New models made older ones obsolete. This did not seem right since the old ones would still do all the things that blind people wanted them to do. Because I was the president and CEO of the Texas Center for the Physically Impaired, I could decide that these computers deserved a better fate, and my board agreed. So, we added refurbishing donated computers to our regular services. We enlisted volunteers to make the computers ready to go again. Since that time, we have shipped almost 400 computers to visually impaired people all over the world. When the Windows-based Pentium computers leave Dallas they are in good working order and ready for a new blind user. The cost, now $50, is just enough to cover our expenses for parts, packing, handling and transporting the machine to its new user. 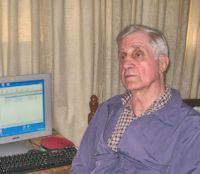 Users assume the responsibility of procuring software, such as a screen-reader and synthesizer or a screen enlargement program, that will allow them to access the information displayed on the computer’s screen. We provide initial freeware, shareware, or demos to allow a new user to have access from the start and to give our computer buyers an idea of the options they may choose among. We have obtained computer training tutorials to assist new computer users. Soon we expect to be able to announce a new service: computer tutorials in Spanish! We are very excited about this new direction we’re going in. Another aspect of our services worth mentioning is our sponsorship of computer training centers in Vina del Mar, Chile and three more in Peru. Our computers and instructors make it possible for blind Chileans and Peruvians to know the freedom and independence of using computers. My wife and I attended the dedication of these centers, where local officials and media, including newspaper and radio reporters and TV cameramen celebrated with us the advent of a new era for blind and visually impaired people in Chile and Peru. It is my hope to continue for many years offering any blind person who wants it the opportunity to obtain a computer at a reasonable price.